“O Canada”… yes, I was in the land of ice hockey, nippy temperatures and good people. Hundreds of Pfizer Pharmaceutical reps gathered in Toronto, to conduct a team building event , explore new, innovative, ideas, how to more effectively reach their communities, communicate with each other, and give back to their community. They practice the Pfizer motto “It takes more than medication to be truly healthy.”It takes a giving, caring attitude, a thankfulness that they have done well, and a willingness to share, give back, and “pay it forward.” So Pfizer chose The Leader’s Institute’s ® Build-a-Bike ® program to put learning, laughing, and giving all in one room. Split into teams, they got very creative. Some belted out songs, others tumbled, all for a panel of judges that decided who was the most creative, enthusiastic, showed the best showmanship, and delivered on their team motto. Tough choice. Lot’s of newly discovered talent. The real competition, using each others strengths to solve puzzles, to get some bike parts. After a lot of “figuring it out” helping others, and getting some help, sixteen bikes stood waiting for the touch of a small hand and foot on the pedal. Surprise! They were rewarded by seeing sixteen shy, but eager kids claim a bike, specially made for them. Yes, there were a few tears. Kids from the Toronto area now understand that many people care about them, that the world can be a pretty good place, that they now have control over at least one object, their bike. 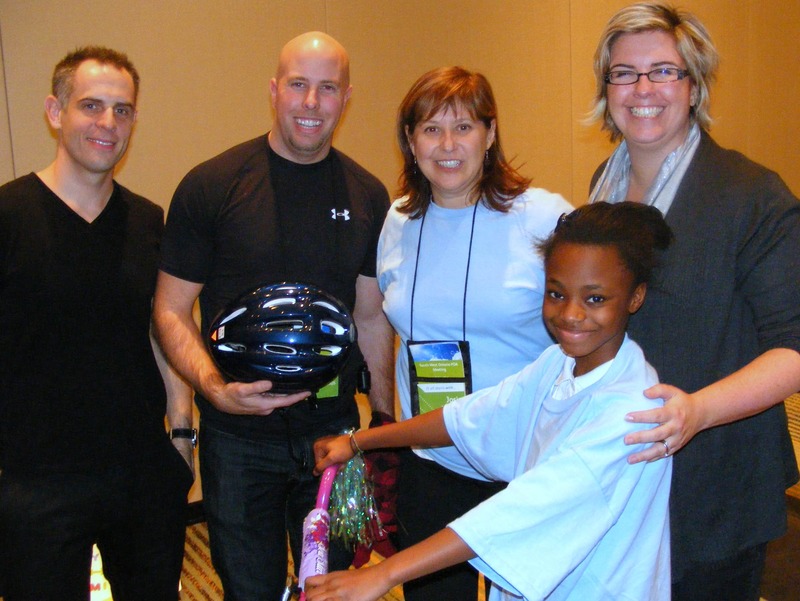 Empowering a child to feel cared about and giving them the power of two wheels is a gift they will long prize.Pfizer employees felt the palpable reward of giving back.